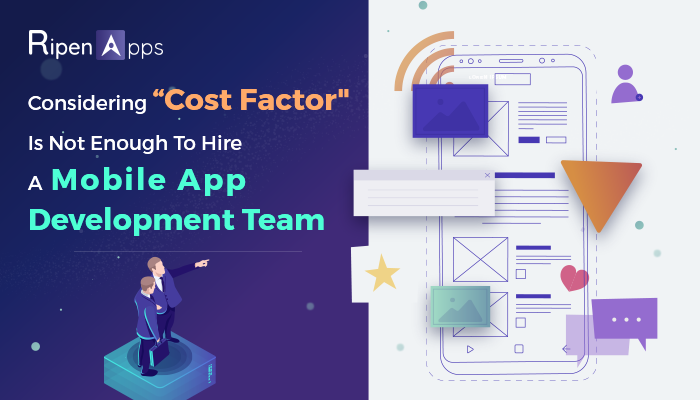 Why Considering "Cost Factor" Is Not Enough To Hire A Mobile App Development Team? Waking up in the morning and reading rising stats of your competitors is more painful than having a hot sip of tea accidentally. Isn’t it? When you see that your competitors have done his business on mobile or has developed their business-related mobile app, it might hurt you when you came to know that the rising results which you have read in the morning are due to having a mobile app. And, why it would not be? When you go outside, you must encounter the scene where people are continually gazing at their Smartphones without blinking their lashes. This will make you realize that you should also have a mobile app for your business. Are you ready to launch your app or improve the visibility of your business? Chances are, you don’t have the necessary skills required to develop your app or the time to sit down and make it work- you probably know nothing or little about writing code, but you still want to bring your ideas to life. Yes, mobile apps have changed the way we do business and engage consumers. If you are not leveraging mobile tools, you will be leaving a lot of money on the table. Studies have shown that users prefer to access the internet through their mobile devices. Well, learning the code is a great option, but for most of the people it is not like that much easy, or they don’t have time to make it happen so. The time you will spend on learning code you would use that time to make more effort towards growing your business. Hire App Developers-might to be a great way to go with. Hiring an app developer is the valuable way towards growing your business or making an app for your business while most of the businessperson came to face many issues in hiring a right app developer who understands their business and make it million-dollar revenue generator. So what would be your primary step towards hiring an app developer? Asking for the cost that the developer would charge to develop your business app. Right? 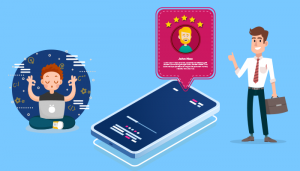 Being a businessperson, you should know some key essentials of hiring a mobile app development team so that at the end of the day you would not regret that you made a mistake. Being a businessperson, it is essential you know upfront the devices you will want your app to support. Some developers will claim they develop for any device and operating system. Don’t you ever take those developers too seriously? But, If you are clear about your objectives and have decided to on the specific devices, you will be keen to stay active on your choice. If your target audience is on Android then focus on developing apps for android or if your target audience is fond of using both the platforms (Android or iOS) then you have to rely on cross-platform app development and this will help you to know the right developer that will buy into your idea and run with it. Well, if you “Want 5 Star Rating on Your App” then go for native app development but if you are hiring a developer who claims to develop the app for both the platforms iOS and Android then be sure they are good at UX & UI and deliver the app with the great performance. Facebook CEO, Mark Zuckerberg said it was their worst mistake. This is grave. Ensure your app developer gets a proper understanding of your project. Because sometimes, you transfer all the required information related to your project to developers, and when you ask them what they have comprehended then there would a line of disappointment traced. Some of the app developers have their own space, and they usually forget the commitment, which they had given to you. Well, in that case, hire the reliable and reputed app development team like “RipenApps Team“. What Are The Factors That Should Consider Before Hiring App Developer? Previously, you have noticed that- “what are the areas where you (businessperson) need to focus by yourself, & now the factors that should consider or ask the app development team or developer which you are going to hire for your valuable project. On the way of hiring mobile app development team or developer, whether you request for a portfolio or, not every serious app developer or app development team will point you to a list of apps, they have developed previously. So, make sure to ask them to show the apps they have done before. To make sure that the app developer is the right fit for your project, you should test a few developed apps and also go for the reviews and the feedbacks of the app. There is also an option to ask the app developers about their past or current clients for which they are working so that you can ask them about the reviews and the deliverables- how committed that developer towards his KRAs, how he has been delivering the deliverables or you can visit the testimonials of the past clients. Before hiring an app developer or an app development team, make sure that which platform your app developer has the expertise or in which programming language he has taken the masters or experience. Ask the developer about their expertise and language recommendation to your project. 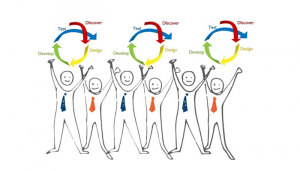 Which Method He Peruse-Agile Development Or Else? In the process of making your business app, you should be sure that the development of the app should not impede due to having some development, cost or other issues. This will be sure while your app development team is using agile methodology or working sprint wise because sprint wise working helps app developer as well as testers to understand what the problem is and where the problem comes from. Agile developers tend to get things done more efficiently and have a better approach to the minimum viable product (MVP). What Is The Technique Of Working That App Development Team Adopt? 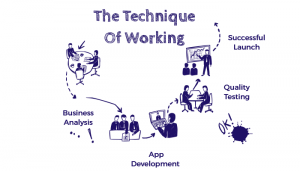 Whether you are hiring an app development team or app developer, you should know the essential technique on which they are working. Fundamental technology refers to- steps they take while making or launching the app. There is 5 best or prior practice that you’re hired app development team or an app developer should have. Analysis of the market or the business you are going to launch, or your competitors have already performed or performing the wireframing of the client’s requirements in terms of meeting their all demands and needs. Implementing those wireframes in the coding world or you can say that the leveraging the programming of software development skills on making those wireframes into successful running code. After implementing accurate coding, there should be quality testing done to ensure that the app you have developed is bug or glitches free. Ex. In-House Testing, Beta Testing. After matching the checklists of the App store or play store, would your app developer can perform App launch or not. Developers use GitHub mainly for version control. 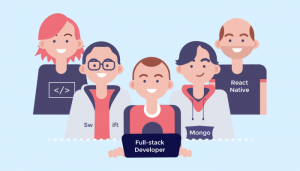 However, most of the developers use GitHub to save up codes or projects they want to share with their team or with the clients. Ask the developers of the development team to share a link to their GitHub Repository. Every mobile app developer must have their Developer account if they have developed or published the app in the past and if they do not have the developer account, then it is the time to cross check once. Asking for the developer account does not mean that you are going to use their developer account, but you only need to confirm that yes he has developed and published apps in his past career. Will He Maintain App Post Launch? As mobile app development has various procedure to perform until its launch, there are also several tasks that should be performed after app launch called “App Post Launch”. App post-launch activities have various tasks- Maintenance & Bug Fixing, Latest OS & Handset Support, Competitor Analysis, Marketing & Branding, Promotions and Campaigns, Analyzing Customer Behavior, Features Enhancements. Documentations are important. When your app is up, and you need another developer to improve the functionalities, the documentation can be of great help. Be sure they provide documentation even for how to use the app. What would be the Payment Locks? At this point, I’m sure you already have a budget for your project. It’s essential you have a transparent and flexible budget for your project before you agree on the pricing terms with your developer. Ensure you set milestones and pay when each milestone has been completed. If you have read this article and not just scan it, then you’re more likely to hire an app developer. It is not a guarantee, but if you follow the steps and take precautions, your next hire will be a blissful experience. I’m sure. Hence, considering the only cost is not the right factor before developing an app. You must focus on the above-mentioned pointers, which could make your money or effort safe and secure. RipenApps is the best place to hire Excellency, Expertise and Experience. If there is any query, then drop us an email at sales@ripenapps.com.